I love contributing to Indiegogo/Kickstarter Projects, especially when they are vegan. I love giving things away on the blog to show my gratitude that you have chosen to follow us on this journey. I love Phoney Baloney’s Coconut Bacon. What could be much better than combining these three things that I love? 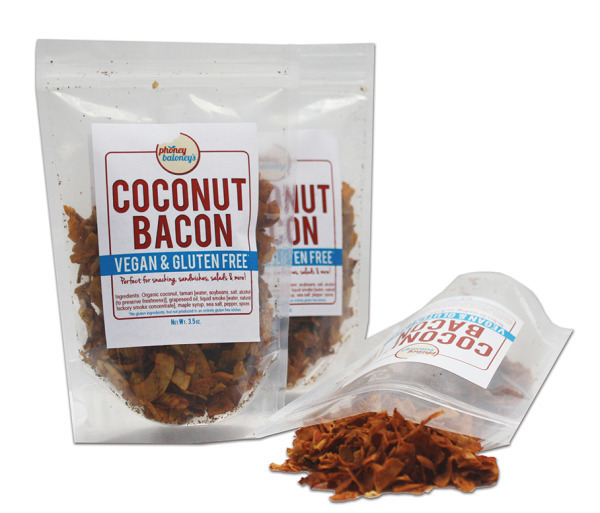 Awhile back, I supported Phoney Baloney’s indiegogo to get their coconut bacon company started. For my support I received not one but three bags of coconut bacon and decided to give away one to the lucky winner of this giveaway to try. Just so you know, it has a rich, smokey flavor. It is crisp. The coconut only offers a hint of flavor, so little, that our little vegan who dislikes coconut, loved it. So far we have only eaten it straight out of the package, and can only imagine the possibilities of what you could use it for. Not sure if ours will actually make it into anything more elaborate becaue we can’t seem to stop eating it! If you are interested leave a comment about how you would like to use it by midnight PST, March 2, 2013. We will choose a winner on the 3rd. By the way, if you haven’t seen PPK’s 100 for 2012 list you should check it out. Phoney Baloney made it on so you know it must be awesome! I would also like to add that Phoney Baloney did not ask us to review it. We were just super excited about it and had to share. We also hope they don’t mind us snagging their picture. Ours didn’t do this amazing product justice! AH! This would be so perfect for a BLT or maybe even bacon-topped brownies? Mmmmm, so many possibilities! I’d use them on pizza, sprinkled on soup or salad, added to beans, or mashed with avocado for a sandwich. Yummm. It would love to try it with potato pancakes – we eat them Swedish way – with (vegan) bacon and lingonberry jam. Also with tofu scramble, in split pea soup, on salads. Classic breakfast with tofu scramble and a side of coconut bacon…yum! I would sprinkle on my vegan maple glazed doughnuts! this would be great to add to my favorite kale salad…with jalapeno/lime/cilantro dressing, and avocados, a bit of mango salsa…yum! This would be delicious in a BLT, tofu burrito, and by itself!!! I never really ate pork bacon, so I can’t say it’s something I miss being vegan – but I can think of gobs of ways to use coconut bacon! Salads, wraps, tofu scrambles, soups, casseroles, and the classic Elvis peanut butter, banana, and bacon sandwich dipped in maple syrup come to mind. My favorite thing to do, however, would be to fool unsuspecting omnivores, which is a hobby of mine! IT WOULD BE A GREAT TOPPING ON RED LENTIL SOUP, OR ANY SOUP !!! TOFU STIR FRY, TOFU SCRABBLE ETC. !!! In vegan potato soup!! YUMMO! I would use it by putting on a veggie sandwich! Yum! I would try my hand at vegan maple bacon donuts.